The aspirational value of a brand does not depend just on the quality or performance of its products, but also on the legacy they bear. For a fact, European manufacturers better the rest of the world in this regard by a considerable margin. There is a reason why most exotic car and motorcycle brands we aspire for today are European  they have a history of making legendary products that are popular even generations later. A few years back when the Indian government allowed import of automobiles, European manufacturers were quick to set up shop. Most European car manufacturers came directly or through distributors, but not many motorcycle manufacturers have launched their products here. To make matters worse, European manufacturers like Ducati, BMW Motorrad and Aprilia who have entered the Indian motorcycle market have taken the expensive CBU route. European motorcycles have traditionally been expensive compared to their Japanese counterparts, and the CBU route has only made their pricing even more exorbitant for India. Imagine our delight then, when we got news of Triumph finally announcing its Indian plans, with the promise of bringing sub-800cc motorcycles down via the CKD route. The iconic British manufacturer has mesmerised motorcyclists for decades and the news even delighted my father. I had a reason to be excited  who can forget the Speed Triple in Mission Impossible: 2? And then the boffins at Hinckley made the Street Triple, a smaller, more fun to ride version of the hooligan. When it comes to 600cc supersports motorcycles, who can forget the 675 Daytona, a motorcycle that has given the great fours from Japan enough reason to worry? But my father's reasons to be excited were different. He has always been a fan of classic machines  he's ridden his friends' BSAs and Triumphs in his youth and is a huge fan of those bikes. Little surprise then that he was excited about the classic-looking Bonneville coming to India as the most affordable Triumph. The Bonnie, as it is known affectionately, has in fact been a topic of discussion for thousands of enthusiasts ever since the news came through at the Auto Expo. In the OVERDRIVE office, the Bonnie's indicative pricing being a mouth-watering Rs 5.5 lakh, ex-showroom has caused enough buzz and we are already waiting for bookings to open. But sadly Triumph has been tight-lipped about its India plans after the Auto Expo. The British marque has left us waiting for updates about their India plans. Till date Triumphs have been those objects of desire that I have only been able to admire in images. On foreign trips I have seen them in the flesh and even heard them but nothing beyond that. Needless to say I have been waiting to ride the Bonnie given the aspirational value it holds, despite being the simplest of motorcycles. At the same time I have also been wondering what makes the Bonnie such as awe-inspiring motorcycle. Its classic styling? The effortlessness in riding? The smoothness of the parallel twin motor? Or its history? The Bonneville is most certainly a legendary motorcycle. The bike was originally introduced in 1959, named after the famous Bonneville Salt Flats in the USA that is used for land speed record runs. The Salt Flats were in fact named after a US army officer named Benjamin Bonneville who explored the area in the 1830s. Production of the Bonneville was stopped in 1983, when the original Triumph Engineering shut shop. The 'all-new' or current Bonneville was launched in 2001 by Hinckley-based Triumph Motorcycles under new owner John Bloor. Though a completely redesigned and reworked motorcycle, the new Bonnie maintains the original motorcycle's classic styling and basic engine configuration but with new-age technology. Itching to ride it, I got lucky when I got to know that someone I know has an uncle who rides a Bonnie. Wasting no time I asked him to let me ride it. It took some convincing though, as his uncle is a connoisseur of classic motorcycles, and is very touchy about his machines. This gentleman owns an enviable set of classics, but what interested me was the Bonnie. Say hello to a legend, I said to myself as I first saw it. The bike in front of me was not an all new motorcycle, but the Bonnie has remained virtually unchanged over the years, and has an old world charm with its classic styling. The motorcycle you see on these pages is the T100, a higher specced version of the Bonneville and was a limited edition as part of Triumph's 2002 centenary celebrations. The T100 here stands for the bike's top speed of 100mph, or 160kmph. The styling of the Bonnie hasn't changed over the years. And it does look like a retro motorcycle  the spoked wheels, round headlight, round indicators with chromed stalks, chromed mirrors and twin coil spring shock absorbers at the rear reminded me of the bikes of yore. The two-pod instrument cluster with a brushed metal finish and chrome around the pods and the tell-tale lights, curvy fuel tank with the chrome finished Triumph logo and chrome finish on the engine casing added to the feel. The silver mudguards looked nice along with the silver-orange paint scheme, while the golden coloured lines (I was informed these are hand painted) added to the classic feel. The Bonnie I got to ride had a different seat from what the stock motorcycle gets and I suspect belonged to the Triumph Thruxton. Same was the case with the rear set footpegs, and the flatter, wider handlebar. The changes had been effected by the owner to give the bike a sporty feel without losing out on the old-world charm, which even the rear end of the bike exuded this effortlessly with its oval stop light and round turn indicators. 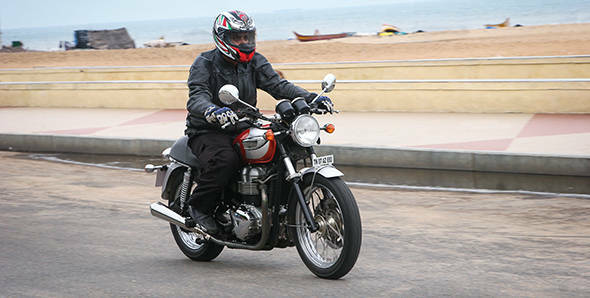 All versions of the Bonneville, including the T100 carry 865cc mills from 2007 onwards, but being an older model the bike I rode used a 790cc, air-cooled parallel-twin cylinder engine, far away from all the electronics motorcycles use today. This being a carbureted version made 62PS at 7400rpm and 60Nm of torque at a lowly 3500rpm. The current generation Bonnie got fuel injection in 2008 and makes 68PS and 68Nm, which tells us that the bike hasn't changed much since. The only difference is that the new bike now makes its peak torque at a higher 5800rpm. The Bonnie's power and torque figures do not sound like much in today's world but this motorcycle has never been about performance or numbers. It has always been about the experience, and that's exactly what came to my mind as I straddled the bike. The engine was quick to come to life as I thumbed the starter, despite the lack of fuel injection. The engine was quick to settle down at idle; the refined hum of the parallel twin pleasing to the ears. The throaty note on twisting the throttle slightly, sounded sweet and was different from any parallel twin I've ridden till date. The riding position felt sporty with the wide handlebar and rear set footpegs, yet comfortable, and I'm guessing the stock bike's riding position would be as comfortable if not more. Despite the bike being old, the clutch felt light, and slotting into first was effortless. I got onto the main road and opened the throttle causing the decibels to rise. I was instantly transported to a different world, as the motorcycle felt calm and peaceful even though accelerating quickly. The five-speed gearbox with the universal one-down-four-up pattern was light and gear shifts were slick and precise. The suspension felt firm yet comfortable and I was barely able to feel the undulations on the road. The Bonnie uses single discs at both ends, and the brakes on the bike I was riding felt a bit old, yet offered decent bite. The bike's friendly character told me it would be an able handler even when pushed hard but that's not what I was trying to do. Usually a new motorcycle has me thinking about its performance and handling when I ride it for the first time. But the Bonnie was different. I didn't feel like whacking the throttle open at every possible opportunity, or trying to go fast. The experience of riding the Bonnie was such that I wanted to absorb every moment of riding it. The sweet sounding exhaust note, eager throttle response and slick gearbox coupled with the comfortable riding position made for an engaging experience, an experience that was very different from riding a tech-laden modern motorcycle. The engagement comes from the sensation, not from the incredible turn of speed, which appears increasingly to be the case with current motorcycles. This was a bike I felt I could ride to work daily and given its simple design probably not bother about it being hounded by a million people wherever I parked it. I realised that the Bonnie's gentleness, simplicity and honesty in being a sweet, forgiving motorcycle are what make it special even today. The bike would fare well on a long ride too but I fail to see a point in doing that. This is a motorcycle aimed at those looking for style and ease of riding. This bike is sure to appeal to those looking for a larger yet friendly motorcycle, one that does not scare the rider. Also, immense attention to detail and the classic styling are factors that will help the Bonnie win hearts of the fans of classic motorcycles, such as my father. Not that I wasn't smitten by this British beauty. I was in fact in awe of it  the fact that a motorcycle can be so simple yet so alluring was a bit of a surprise. I guess that's what its beauty is.